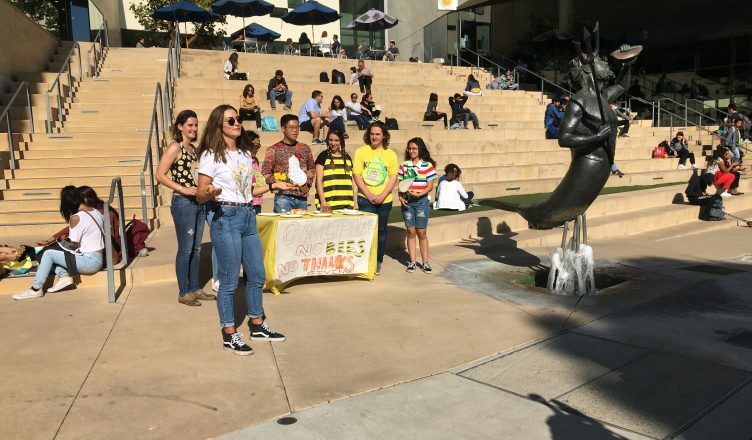 Students in the UC San Diego chapter of the California Public Interest Research Group held a small press event on Tuesday, Nov. 20, highlighting the necessity of bees in cultivating many food products. Holding the event during the weekly farmers’ market in Matthews Quad just two days before Thanksgiving, the group hoped to bring attention to the crisis of large populations of bees dying off to both students and farmers. The event is a part of CALPIRG’s statewide campaign to ban neonicotinoid-based pesticides. CALPIRG set up a table near the Triton statue, displaying what a Thanksgiving dinner would look like without food products that are dependant on pollination. The only foods on the table were meats and bread, and several empty plates were on display. Emma Youngquist, CALPIRG’s media intern for the Save the Bees campaign, explained the organization’s tactic to the UCSD Guardian. The Environmental Protection Agency cites a number of factors in colony collapse, or mass disappearance of worker bees in a hive. Among these factors are invasive mites, poor nutrition or environmental stressors on bees. Youngquist noted that while there are a number of different reasons attributed to major colony collapse, the campaign’s main focus is on the use of neonicotinoids, or nicotine-based pesticides. The California Department of Pesticide Regulation, a board and department of the California Environmental Protection Agency, began refocusing its evaluations in 2009 to determine the effects of certain neonicotinoid pesticides on essential pollinators, such as bees. In January, the department announced that it would no longer consider any applications by pesticide companies that would expand the use of neonicotinoid pesticides in the state. According to CDPR, there are more than 2.5 million honey bee colonies in the U.S. that pollinate an estimated $15 billion of crops each year. Approximately 1.8 million of those colonies are used each year in California to pollinate the state’s almond crop alone. The European Union banned the use neonicotinoid pesticides back in April of this year. Bayer, a multinational pharmaceutical and life sciences company, released a statement in response, condemning the move. When asked if there were suitable alternatives to nicotine-based pesticides, Youngquist stated that there is more research being done but that banning the use of neonicotinoids was the more urgent course of action. Sophie Haddad, statewide chair for CALPIRG told the Guardian that the response from students and vendors to the event was positive and garnished significant support for the cause. Haddad also urged people to contact their representatives in state legislature to bring up their concerns on the issue. “The more our legislators hear that this is an issue their constituents care about, the more likely they are to prioritize it,” Haddad said. “We have the people power and grassroots support, so I think we can make that happen,” Youngquist said. CALPIRG is planning to meet Assembly Member Todd Gloria in Week 10 to urge him to take legislative action against the use of neonicotinoids. Gloria is a noted environmentalist who co-signed SB100, the clean energy bill that CALPIRG rallied for.